A qi gong and tai chi energy exercise class for all levels! 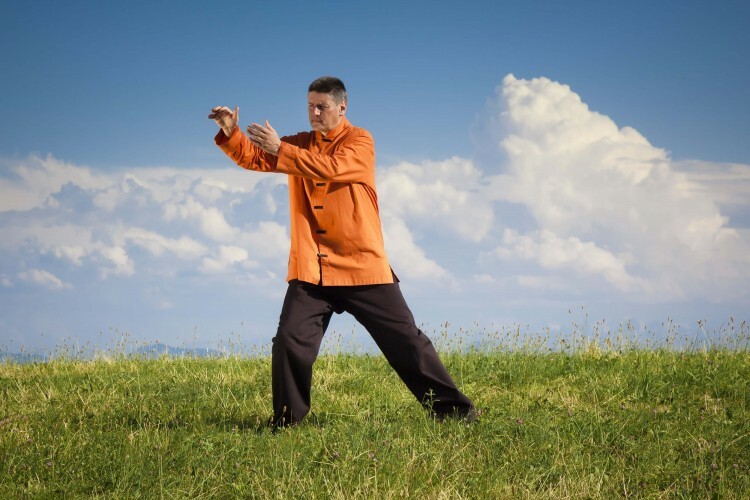 Enjoy a complete and relaxing class learning exercises from various qi gong sets including Dragon and Tiger, Tai Chi Circling Hands, Energy Gates and more. In this class qi gong is taught by a method known as “separate and combine”. Components and micro-components of the moves are learned and, when comfortable, combined into one seamless movement. Moderation is also taught under the “70% rule”. We never put our body, mind or nervous system under strain by only doing our chi practices to 70% of our ability. Bending and stretching to 70%, 70% mental effort, 70% reps and so forth. This makes learning safe, comfortable and relaxing. Trying less is more, as tension leaves the body and mind through the practice of moderation. You’ll begin to tune into the physical movements: basic body alignments, moderation, coordination, balancing, rudiments of longevity breathing and ways to move which protect and lubricate the joints. Progressing further we steadily integrate internal techniques (nei gong) into the movements, amplifying the health benefits and providing an engaging journey into these ever-evolving arts.